Divina was fast asleep as Tempest approached her bed. She hated to wake her, especially when she was cranky when she was wide awake. Divina was even more grouchy when you woke her for no reason. But Tempest had a reason, or so she kept telling herself hoping she wouldn't have to face Divina's wrath. She wasn't scared of her, it was the fact that when she was grumpy she had the tendency not to cooperate, not even with Tempest. Tempest took a deep breath and shook Divina till she woke. "What the bloody hell do you want?" "The Lady of the Lake summoned me." Divina jerked up and stared at her. "I wouldn't have woken you if it wasn't." "Then get on with the bloody story." Tempest nodded and told her everything that had occurred the night before. When she was done Divina looked at her as though she were crazy. "I'm going back to bed. I am not going to send my family on some wild goose chase for nothing. When you have more information, them maybe I just might consider it." She went back to bed and pulled the covers over her head. Tempest rolled her eyes and stomped her way back to the common room. "She said no, didn't she," said Nila. "I told you, you should have waited until Divina was fully awake and had at least eaten," said Void in his most annoying told-you-so voice. "Anyway," she said glaring at him, "we need to do more research and I told my sister to send my book back to me today. Once I get it we should be able to find a lot of information." "That could take months though," exclaimed Nila. "Then we had better get started already." Christmas came and they all decided to take a break from all their research to enjoy the holiday. She opened her present in front of the fire place and threw the package wrapping into the warm fire. She had received some more advance magic books from her godparents and put them aside. From Draco she had received a silver anklet with hearts linking together. She put it on immediately and continued on un-wrapping her presents. Her mother had sent her family picture of a picnic they had all taken together just after Edana was born. Her brother Jason had sent her some bracelets and a necklace. Edana had sent her a picture she had drawn herself of Tempest's dragon on top of her head along with a new nest padding for her dragon. Selene had sent her and Auror's handbook hoping that if she studied hard enough she could keep herself as safe as possible. I guess she does care, she thought. Her last present was from Chad and it made her sad because he wasn't even here. It was book and on top of it was a letter. Dear Zephyr, it read, Merry Christmas! I was reading this book after I overhead your conversation with Void and Nila. Well after that day, I thought I would help out and give this to you as a present. I just thought that maybe . . . I don't know what I'm saying anymore. Look, I wanted to give you this book because I know it will help you. Happy Christmas Zephyr. Love, Chad.Tempest smiled and slipped the note into the book. "I'll be in the library for the next couple of days okay." Before they could speak she was already out the door with her new book at hand. She was in her pajamas and walking calmly. She noticed people staring at her with that big grin on her face. She didn't care. Chad said love, and he seemed to stutter in his note. She had never heard those words from Draco, at least not directed towards her. She entered the library and took a seat in a dark corner on the second floor. She opened the book and quickly flipped thought it to see how long it was. It was pretty long. Her stomach growled and she swore under her breath. "I guess the book will have to wait till after I eat breakfast." She ran down the stairs eager to read and hug Chad and maybe, just maybe share her first with him instead of with Draco as she always thought she would. A plate was already set for her and Void and Nila looked at her as though they weren't surprised to see her. "You guys know me so well," she said taking her seat. "Well we thought you would already be here, but I guess we were wrong and since you love to eat, we knew you would come sooner or later," remarked Void. "Ha, ha very funny, this coming especially from the guy who lives to eat." She placed the book on her lap but the note fell out and like a snake, Nila snatched it. "Aw, he signed with the word love. That is so sweet. Choose him over Draco." "She's known Draco longer and they both have liked each other since they met. They belong together." They continued on arguing for a couple of more minutes before Tempest finally told them to shut up as she snatched the note back. "You two can be such children sometimes." "But we are children," said Nila. Tempest rolled her eyes and stared at the book. Time to get cracking, she thought. She read the first chapter of the book, but kept losing her focus whenever she thought about Chad's letter. She sat alone in the dark corner and folded her legs. "Ouch," she exclaimed. She looked at her anklet. A heart had been embedded into her skin and was beginning to get covered in blood. She looked up. "You're mocking me aren't you God," she said. A couple days passed and Chad was back. He sat with her against the tree she had fallen out of exactly a year earlier. "So . . . dID you like the book I got for you?" "Of course! Because of you I now have enough information to coax Divina into looking for the lair." "So how thankful are you exactly?" "Not that thankful," remarked Tempest with a smirk. She laughed a little and stopped when she noticed that he was just staring at her her. She swallowed and smiled. Then, just like that, the magic was broken. "Zephyr!" called Void as he ran to her. She looked at him and he stopped in front and bent forward as he tried to regain his breath. Nila just stared at him with annoyance. "Divina . . . " sputtered Void. "What he's trying to say is that there is a festival going on under water and she's required to be there. She's leaving in a few minutes!" Tempest stood up and began running to the lake. She saw Divina and yelled after her. "Just listen. The Lady of the Laky lair is somewhere in the Northern part of Britain. Only a couple of the lakes up there are salty. Please try and find her." "Give me one good solid reason why I should help you find her." "You're mind friends and guardian and if we don't find her or her sister Merwick will come I try to kill me!" Divina stopped wiling on her way back to the lake. She turned around and stared at her. "But you love me too." "Of course." She sighed. "After the holidays okay. When I return let you know that I'm found it. Okay?" "I hate it that you make me to ridiculous stuff." "I know you do, especially when I play the guilt card." "Especially when you play any card." Divina said her goodbye and dived into the lake." Tempest smiled and turned around. "I love it when I get what I want." Void sighed, Nila rolled her eyes and Chad just smiled. 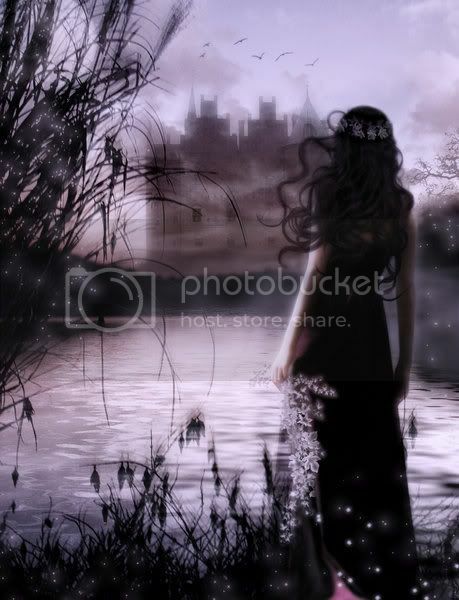 She smiled back and wrapped her arm around his and began back towards the castle. A week and a half past and Tempest had to explain to all the teachers why she wasn't there. Bending the truth like she always did of course. A couple more days had past and she couldn't take it anymore. Tempest skipped class that day and waited by the edge of the lake eager for Divina's return. To her, the day seemed to go very slowly but before she knew it, it was dusk. "I better get going," she said aloud to herself. "I'll try again tomorrow." As she was leaving thought, she thought she heard someone call her name. It was Divina. Tempest ran back to the lake and Divina smiled an hello. "I found it Zephyr. I know where the Lady lives." Tempest smiled and pulled Divina up.